Poem number 19 for April 2015. A sort of surreal imagining based on a Cuban snippet. I want to hear some live Cuban music. After dinner I walk down to the Malecon to catch a scooter-taxi. The taxi driver is the biggest and blackest man I’ve ever seen, with the whitest teeth I’ve ever seen – they almost glow as night draws in. He quotes $5 to take me to Habana Vieja (Old Havana). He is loud and humorous and friendly, like most Cubans. He tells me “you need to find a woman. You haven’t lived until you have fucked a Cuban woman”. I tell him I am married. He says so is he, but it makes no difference. I say “no thanks”. He laughs and points out a few of the “chicas” as he speeds along the Malecon, looking more at me than at the road. I ask him where to find the best music. He recommends La Bodegita del Medio and drops me nearby. 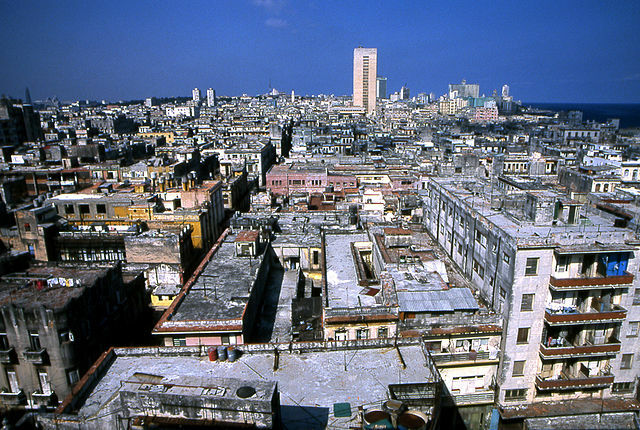 This area of Havana is well preserved: cobbled streets, no traffic, it could be an old part of Madrid or Barcelona. The Bodegita is a small, cramped, L-shaped bar with wooden partitions to the street. There is indeed a good band playing, nestled in the corner, backs to the street, guitar, double bass, maracas, drums and all of them singing intricate harmonies. The maraca player occasionally bangs his maracas on the partition. It the best I’ve heard so far, but the place is a bit touristy, and the beers are tourist prices i.e. $3 for a beer compared to the usual $1. After two or three songs, the guitarist passes around the hat and pushes their CD. I buy one for $10. I walk about 100 metres and hear another band. A more down-market but bigger bar. Ceiling fans, waitresses, cigar smoke. The band are OK. A female flautist does a dance routine with the male lead singer. I walk for another ten minutes and come to the Bar Monserrate. The band here really cooks: saxophone, electric piano, drums, guitar, vocals. The sax player is a virtuoso, sprinkling references to Gershwin in his solos. I wander further, past a derelict, partly demolished building in which chairs have been set up and there is an improvised bar in the corner, and a small stage. The band on the stage look and sound like the Buena Vista Social Club. Great vocals. But the rain starts, and it gets so heavy that they call the gig off. I get a scooter-taxi back to Vedado. A different driver. Not a good-time guy, a serious guy. No talk of Cuban women, but of Fidel and Chavez and a big deal they are pulling off. 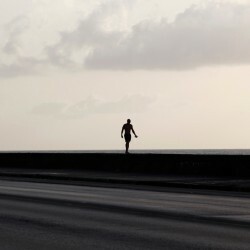 I’m cycling on the Guanahacabibes Peninsula, to the westernmost point of Cuba to see Fat Mary the Prostitute. She’s not there anymore, but the town of Maria La Gorda is named after her. Maria was an aboriginal Venezuelan woman, cast aside by pirates once they had tired of her. When the pirates departed, she set up an “inn” where she made a living by entertaining sailors and locals, and grew fat on the proceeds. 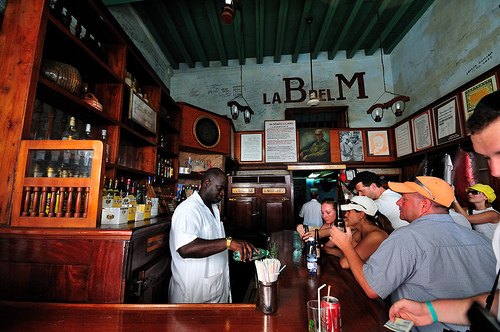 The inn is now a Cuban hotel. Cuban hotels are almost all terrible, but there’s nowhere else to stay at Maria la Gorda. Once I’m on the peninsula, the landscape changes from small farms to thick scrub, which is high enough to cast much-needed shade over the quiet road. Clouds of white and yellow butterflies rise up in front of my bicycle. 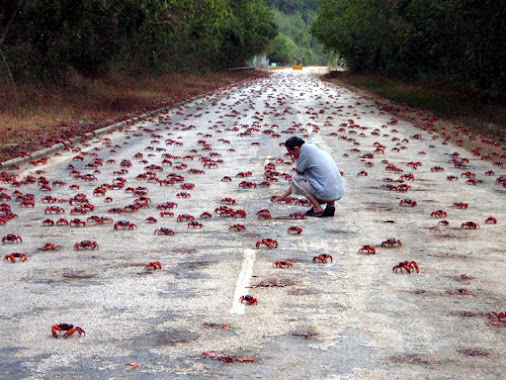 Thousands of small red crabs scuttle sideways across the road. A vulture flies along the crest of the road in front of me for a few hundred metres after I disturb it from its road kill. I stop by the roadside about 11:30 for an early lunch. 44 kilometres covered. A hundred mosquitoes descend on me, but obligingly disperse when I wave my arms frantically. My backside is sore. I adjust the height of the saddle and get back on the road. At 52 kilometres I reach the sea at Bajada. I was told there was high security here because of the fear of U.S. invasion and the sparse population along the coast. There’s a boom gate across the road. The guard is asleep in his hut. I stop obediently but it seems a shame to wake him. I cycle around the boom gate. The last 14 kilometres is alongside white sandy beaches. The road gets rougher. It’s completely washed away in places. It’s covered in white debris – what looks like a mixture of sand and marble. I’m wearing an old long-sleeved business shirt I bought in a shop in Vinales for 33 Cuban Pesos (about $2). I didn’t know it was old until I unwrapped it and saw the soiled collar, but for $2 it was still a bargain. The long sleeves and high collar will give me some protection from the Cuban sun. To try to stay cool I have unbuttoned the shirt all the way down the front. Despite my downward facing position on the bike, I find that my stomach and chest are turning lobster red from sunburn; the sun’s reflection off the white road. I reach the hotel at Maria La Gorda. I haven’t booked, so if it’s full I either sleep out in the open (not a good idea) or turn around and head 70 kilometres back to Sandino (impossible, I’m exhausted). The Señorita at receptions says “Si”, they have a room. She is not fat. Her name is not Mary. Poem number 9 for April 2015. I’ve picked up a quarter written poem about cycling in Cuba about ten years ago. On arriving in Havana, I discovered that my bike had been damaged in transit, and a couple of critical pieces of it were missing viz. the bolts that hold the handlebars and the derailleur in place. I nearly went straight back home. You just can’t get bicycle spares in Cuba. But I found a man who was an amateur bicycle mechanic, and he was my saviour.